Father Jonathan Weldon came to St. Paul's in June of 2008 from the Diocese of Oregon where he had been serving as Canon to the Ordinary of the Diocese since 2004. Father Weldon was born and raised in Oregon and graduated from the University of Oregon and The General Theological Seminary in New York City. He came to the Episcopal Church in his twenties at St. Timothy's, Salem, Oregon, which sponsored him for ordination. After some years as a priest he found that he had a heritage which included ancestors who were Episcopal priests in the 19th Century Mid-West. He served as curate at St. Mark's Medford, and then vicar, and then rector, at Episcopal Church of The Resurrection in Eugene, Oregon. Father Weldon is married to Sharon, a massage therapist and student and teacher of the Enneagram. They are parents of two adult daughters who bring joy to their lives. He enjoys the out-of-doors and living near the Salish Sea and the Chuckanuts and the splendid North Cascades. In the past he's been a choral singer, and he likes a good book. Sharon gets his help from time to time in her renovation of the gardens around their house. Fr. Weldon believes the Church is renewed by grasping how it is that all the members of the Church receive a commissioning for compassionate ministry in Christ's name through the vows of Holy Baptism, and believes the work of the clergy is to support those ministries, and enjoys seeing St. Paul's being renewed in this understanding. Marsha Vollkommer joined the clergy team at St. Paul's in October, 2014, "landing on the church's doorstep and being warmly taken in." Marsha's official title is Associate Priest for Pastoral Care. In that capacity she is coordinator of St. Paul's ministries of care, and her belief - and passion - is that God is calling each of us to care for one another in a myriad of ways. She is also a member of the liturgical and preaching teams. Following husband Rob's retirement, the Vollkommers had relocated from Pennsylvania to Illinois in 2005, built a house, and planned to garden, fish, read, and visit family 'unto eternity.' Life, in its complexity and variety, intervened. In 2008 Marsha was called to the priesthood, went through the discernment process, and entered seminary just one month shy of her 61st birthday. She received degrees from Wartburg Theological Seminary (ELCA) in Dubuque, Iowa and Seabury-Western Theological Seminary (Episcopal) in Chicago. Marsha was ordained to the priesthood on May 25, 2013, and served as Priest Associate at Grace Episcopal Church in Galena, IL. Marsha was born and raised in a small town in Iowa. Prior to her outward commitment to doing God's work in the world, she received a degree in Child Development from the University of Delaware, raised three children as a stay-at-home-mom, did a brief stint working in a bookstore (almost heaven, but not quite) and did reporting for a small Pennsylvania newspaper. Of her children she says, "Rob and I learned early on that all we had to do was love them unconditionally - and they have taken us places we never dreamed we would go." Oldest daughter Mia, an artist and Life Long Learning coordinator at the University of Utah, currently lives in Salt Lake City. Mara, the middler, is a pediatrician at PeaceHealth St. Joseph's hospital in Bellingham, where she lives with husband Patrick, and youngsters Ewan and Maisie. Son Max is an officer in the USAir Force and was recently promoted to Squadron Commander at Laughlin AFB in Del Rio, Texas, where he lives with wife Meghan, and their children Addison and Charlie. After many trips to the Pacific Northwest for family gatherings, Rob and Marsha decided Bellingham would be an even better place to live than to visit, and they made it permanent in 2014. Gardening, fishing, reading and family have not fallen off the list. Lindsay was ordained to the transitional diaconate (and will soon be ordained as a priest) by the Bishop of Oregon at Trinity Cathedral in Portland, Oregon on June 16, 2018. Lindsay graduated in May from the Louisville Presbyterian Seminary in Louisville, Kentucky. She also earned a diploma in Anglican Studies from Bexley-Seabury Theological Seminary. She has a certificate from the College for Congregational Development of the Diocese of Olympia. Lindsay was sponsored for ordination by St. David of Wales Episcopal Church in Portland, Oregon and made a postulant and candidate for Holy Orders by Bishop Michael Hanley of the Diocese of Oregon. Lindsay was active as a lay leader of St. David's during a time of remarkable growth and re-development. Before ordination Lindsay worked in Portland for Ecumenical Ministries of Oregon as manager of their HIV Day Center, previous to which she worked in a multi-service family resource center in the Portland Metro area. She has worked in social services and taught English as a Second Language. She has been a diversity trainer, program manager, community organizer, board member, events coordinator, church speaker, guitar player and knitter. Lindsay is married to Gregg Brekke, an ordained minister of the United Church of Christ and Editor for Presbyterian News Service, the communications agency of the Presbyterian Church in the USA, which is headquartered in Louisville. He is a seasoned mountain climber, having just completed an ascent of Denali. They will make their home in Bellingham. Lee Cunningham was ordained an elder (presbyter) in the United Methodist Church in 1976 and has served churches in Southern California in the communities of Orange, Placentia, Newport Beach, El Centro, Santa Barbara, and the Inland Empire. With his wife Charlene, he helped start United Methodist Marriage Encounter in California and helped lead Emmaus Weekends (Cursillo with a Methodist accent) and the similar Epiphany Weekends for prison settings. In his ministry Lee has always emphasized the importance of the sacraments and the spiritual disciplines and practices of the John and Charles Wesley, the Anglican founders of the Methodist movement, as well as healing ministry, music, and evangelism. Lee is a member of the Order of Saint Luke, a dispersed ecumenical religious order focused on sacramental and liturgical scholarship and practice, and ongoing spiritual formation guided by the Rule of Life and Service. Lee married Charlene in 1973 and describes her as his "best friend and strongest asset" in his ministry. Lee retired from parish ministry in 2010 and moved with Charlene to the Bellingham area where they began attending St. Paul's, where they "both realized they had come home." Lee appreciates the Episcopal Church for upholding as norms the emphases he has always valued in ministry, and which are embodied in the Book of Common Prayer. Lee is enthusiastic about Journey, our catechumenal formation process, as well as our outreach to the poor among us. Charlene was confirmed into the Episcopal Church in 2011. In 2016 Lee and Charlene made pilgrimage to England to take part in Cathedral worship, where he renewed an interest in the ministry of reconciliation embodied in the Community of the Cross of Nails that developed from Coventry Cathedral. In his non-stipendiary position Lee provides leadership for Taizé Prayer, Healing Prayer, and the Recovery Ministry, and preaches occasionally. While his attendance and service is gladly within the Episcopal Church, his Holy Orders remain in the United Methodist Church, and his ministry is conducted here under the guidance of our bishop and the terms of the present state of ecumenical relationship between the Episcopal Church and the United Methodist Church. Lee and Charlene live in Glenhaven, sharing a home with two retired guide dogs. Their daughter Rebekah lives with her husband Kyle in Abbotsford, BC and daughter Melissa lives in Richmond, California. Born in Tacoma, Wade was raised there and in Germany and graduated from Western Washington University with a B.A. in Piano (with an emphasis in accompanying) and a minor in French. While a student at Western, he spent two summers in Austria studying piano, vocal accompanying and opera coaching. After graduating from Western, Wade did one year of post-graduate work at Pacific Lutheran University in organ, and was one of four students chosen nationally to perform in the international organ symposium The Organ in the New Millennium. He then went on to the University of Notre Dame where he received the Master of Music in Organ Performance. This was followed by study in Germany at the Conservatory for Music and Theater in Rostock, where he was awarded the Concert Exam in Organ Performance, which is Germany's highest degree in musical performance. While pursuing musical studies in Germany, he also attended the European Bible Training Center in Berlin, where he studied New Testament Theology. Wade has performed as organist, pianist, and accompanist throughout Europe, including Germany, Austria, Hungary, Italy, Scotland and England. He has been involved in church music ministry for over twenty years and works part time at Western Washington University as a staff accompanist. Wade was hired as St. Paul's Music Director in June, 2007, after a national search. Nicole joined the staff of St. Paul's in 2012 first as the coordinator of Journey to Adulthood, and currently as the Director of Youth Ministries. Nicole and her husband Matt are the parents of two kids, Ellie, who will be a 6th grader in the fall, and Kai, who is about to enter 4th grade. The family joined St. Paul's in 2004, after moving to Bellingham from Seattle in 2002. Nicole was raised in Seattle and is a proud graduate of almost 12 years of Catholic School. She has a Bachelor of Arts in Humanities from the University of Washington with an emphasis in Drama and Creative Writing. She spent five years in an artist-in-residence internship with Bishop Blanchet High School, Seattle, where she taught playwriting to high school students, wrote two plays for production, and served as a youth mentor. In 2015, Nicole graduated with a certificate in Youth and Family Ministries from Bexley Seabury and Forma after a one-year course of study. When Nicole isn't here at church, she and her family enjoy spending time doing projects around the house, swimming at BAC, travelling locally, and going to the beach--any beach, any weather! Lindsay came to Bellingham in 2005 to attend Western Washington University. She graduated in 2008 with a degree in Elementary Education. After graduating, Lindsay taught 3rd grade at a local Christian Elementary School, followed by a year of substitute teaching and volunteering here at St. Paul's with the Sunday school and other children's programs. Over the course of that year, Lindsay's responsibilities at the church grew and she is now the Director of Children and Family Ministries. She started the Godly Play program here in 2009. Lindsay is also a nationally accredited Godly Play trainer and has helped 3 other Bellingham congregations start Godly Play in the parishes, as well as several other churches is the greater Seattle area. Lindsay and her husband, Ryan, have been married since 2008. They have three children, twin boys - Benjamin and Aaron, and younger brother - Caleb who keep them on their toes! In her spare time, Lindsay likes to go for bicycle rides around town, play at the park with the kids, listen to music loudly while cleaning up the house, sew, craft, redecorate and reorganize her house (often to the dismay of her wonderful husband! ), facebook, blog, and watch movies. Note: Lindsay is one of only 60 certified trainers of the Godly Play curriculum. She went to Boston in the fall of 2012, and has completed her certifications. Congratulations Lindsay! Myra joined St. Paul’s staff in 2016, bringing with her a wealth of church and nonprofit management experience. Baptized Methodist, confirmed Episcopalian, and a member of Lutheran churches for 15+ years before making her home at Christ Episcopal in Blaine, Myra has an ecumenical appreciation for the gifts of many faith communities. As a church member, she has served as a Sunday School Teacher, Sunday School Superintendent, Cantor, Choir Member, Adult Education leader, Women’s Retreat Facilitator, Stewardship Committee Chair, Labyrinth Ministry Team Chair, Worship Leader, Preschool Chaplain, and Scripture Reader. After growing up on a family farm in north Florida, Myra spent four years at the University of the South, Sewanee, TN, where she obtained a B.A. with honors in Philosophy with a minor in Religion. She moved to the Pacific NW in 1992, and worked in the nonprofit sector for ten years before starting her own business, The Laughing Flower Labyrinth Company. A Veriditas Certified Labyrinth Facilitator and labyrinth designer, Myra has installed nearly 50 labyrinths in Washington State and beyond. Myra was a member of the Project Labyrinth board that was responsible for installing the Fairhaven Park labyrinth in 2010, and she installed two labyrinths at Stillpoint in Bellingham, where she served as a member of the Stillpoint Spirituality Center board for six years. In the Episcopal church, the vestry members are the ruling committee and legal representatives of the church. They provide leadership and management of the matters of the church under Canon Law. St. Paul's Vestry is composed of 12 non-Clergy members. 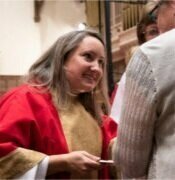 The Rector is also a member of the Vestry. Leadership includes tasks such as Discerning a vision for the future, Articulating and Communicating the Vision, Generating enthusiasm and "buy-in" from the congregation, Setting the tone for leadership and serving as an example to the congregation. Management includes all matters of Budgeting, Establishing and Enforcing Policies and Procedures, Establishing Action Plans and Maintaining Property. The vestry meets on the third Monday of each month at 6:30 PM on the upstairs level of the Education wing. Feel free to contact any of the members of the Vestry at any time with issues of church function or anything else on your mind. To get on the agenda for a vestry meeting, contact the Senior Warden. To attend a vestry meeting, just show up. St. Paul's is a proud part of the Diocese of Olympia. Over 31,000 people in more than 100 churches. We are building strong communities of faith. We are striving to be good stewards of all our resources: our time, our talents, our treasures and our Earth. We are deepening our relationships with people under 35, and with others: in the Holy Land, Latin America and all around the world. The Diocese of Olympia is in Province VIII and one of 110 dioceses in the Episcopal Church of the United States and a member of the worldwide Anglican Communion.